When we were confronted with the diagnosis of Stage IV NSCLC, we were utterly shocked. How would you feel, when your wife, 31 years old, in good shape (we went on a 15km hike just 2 weeks before the diagnosis), was told she had advanced lung cancer? I'd guess you'd feel the same... "Luckily", an oncogene mutation was found, for which targeted therapy existed. The mutation, a ROS1 gene fusion, offered a better prognosis, with an average of 2 years progression free survival, using the recently approved Crizontinib drug. So bear with me, as this my personal understanding of the scientific literature. I do not claim this to be correct ! How long do you take it? Until you develop resistance and the tumor progresses. All patients will develop this, as tumor cells are still present. ROS1 is a so called receptor tyrosine kinase. Receptor proteins, located on the outside of cells, are responsible for transmitting environmental signals to the interior of the cell. These signals are responsible for events like cell growth, cell movement (migration) or cell death. Typically, molecules, like a hormone or a nutrient, bind to the outside part of two of these receptors. This binding brings both receptors together (forming what is called a dimer), leading to a change in its structure, and making the interior side available to be contacted by a "receptor tyrosine kinase". These RTK's will alter the interior part a bit, by adding a phosphate group to the "Tyrosine". This makes the receptor 'active', and passes on the signal. Simply put, a receptor protein can be seen as the first domino block in a domino series. The RTK can then be seen as the person pushing it, when the start signal is given, setting the whole series in motion. It's shown rather well in the video below. In case of ROS1, the protein is both a receptor (it can bind to extracellular signal molecules), and a kinase. When the dimer is formed, ROS1 can add the phospate group to its own tyrosine residues on the intracellular part of the protein. This 'autophosporylation' capacity will become important later on. 2. 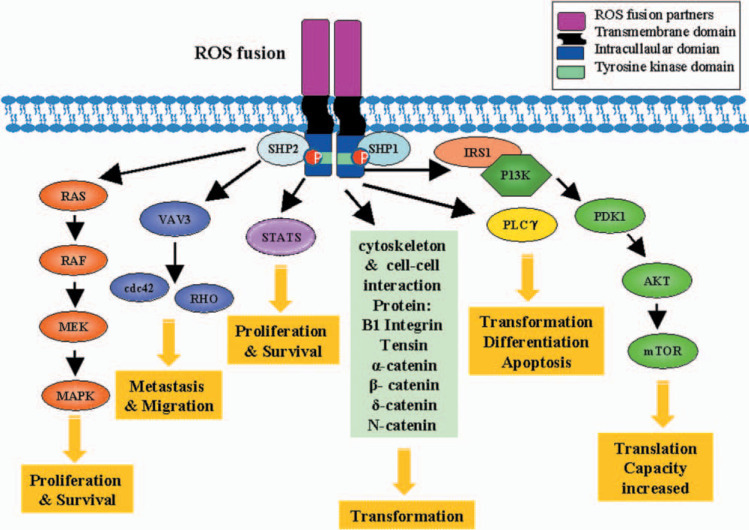 Why do ROS1 gene fusions lead to cancer? When this cascade is broken, it can lead to signal that constantly 'on'. Image a light switch you can't turn of. In case of ROS1 gene fusions, the inner part of the protein, with the signalling sections, is fused to a different exterior part. A part that doesn't need a external signal to push the domino series, or biologically, to create a receptor dimer. Hence, the protein keeps on firing signals, setting all kinds of cellular events into overdrive. 3. Do we really not know which pathways are involved? No, not really. But there are some hints and leads that helped me to understand the effect of Crizotinib. In the following sections, there are a lot of gene names mentioned. This might seem overwhelming, but keep in mind that the names don't really matter. Their function does: do they promote or inhibit growth, or do they cause cells to commit suicide or to ignore signals to die. First, 20 years ago, it was shown by Zong et al that ROS1 is able to activate STAT3, a member of the JAK/STAT pathway (more on this later). They showed that increased STAT3 activation caused aberrant growth, independent of cell anchorage, and that blocking STAT3 function (by introducing dominant negative mutations that prohibit its functioning) reduces cell growth again. Thus, increasing ROS1 activity, as seen in ROS1+ cancer, causes cell growth, but only if the downstream actor STAT3 is functional. A second study from 2002, by Nguyen et al showed that several members of another pathway, the PI3K-signalling pathway, were also involved in the aberrant growth following ROS1 overexpression, and that blocking these pathways blocks growth, even if ROS1 is still overactive. 4. What are tyrosine kinase inhitors ? (warning : biology overkill) ATP is one of the energy sources available in cells. It consists of adenosine (one of the building blocks of DNA), with three (tri) phosphate groups bound to it (hence, (A)denosine (T)ri (P)hospate). By transfering one of these phosphates from ATP to various proteins, the receiving proteins become activated. They wake up and start performing their intended functions. The phospate transfer is mediated by a group of proteins called 'kinases', in case of receptor tyrosine kinases, they first transfer the phosphate to themselves, before activating other, downstream signalling proteins. It is this auto-phosphorylation that is blocked by Crizotinib, as the 'donor' ATP can not bind the required active site of the receptor. And as a consequence, the receptor cannot activate downstream signals. So, Crizotinib is a very specific molecule that blocks the functioning of the ROS1 (and ALK) receptor tyrosine kinase. Overactive ROS1 is known to induce two processes involved in cell growth. So by shutting down the ROS1 signal, we are shutting down the continuous signal to grow. The light switch is 'ON', but we cut the wire. Being so specific, this also explains why mutations near the binding site of ATP can make the tumor resistant. If you slightly change the lock, one key, or in this case Crizotinib, won't fit, while another, ATP, might still do. All of the above explains why crizotinib stops tumor growth. We reduced (or eliminated) the signal to grow. This is what seems to be the general understanding amongst patients. Crizotinib halts excessive growth, but you need to keep taking the drug. The cells fall back to normal mechanisms, but they might keep dividing at a slow(er) pace, as lung epithelial cells seem te be capable of in the context of injury (source). This doesn't explain however, why many patients see a spectacular tumor reduction in the first weeks or months, with some patients even becoming NED (no evidence of disease, or clean scans). This seems to implicate that tumor cells are dying as a result of Crizotinib inhibition. So let's take another look at the pathways in which ROS1 is involved. To explain tumor size reduction, it is important that ROS1 overexpression was shown to induce STAT3 (source), and recently, that Crizotinib lowers the STAT3 levels in an ALK+ cell line (H2228, source). Although the evidence is indirect (TKIs have not been shown to reduce STAT3 levels in ROS1+ NSCLC), it can be expected that lowering ROS1 levels will reduce the STAT3 overexpression. More importantly, the latter study report several interesing findings related to Crizotinib. First, as expected, cell growth was strongly inhibited. Second, they also showed that crizotinib reduced cell migration, and that this inhibitory effect was enhanced with the prolongation of treatment. So not only growth rate is reduced, also the ability to metastasize seems to reduce over time. But most importantly, it was shown that the reduction of STAT3 increased the rate at which cells commit suicide, and the rate seems to increase over time. Although the exact mechanism of apoptosis is not mentioned in the article -and as a colleague pointed out, there are many, many more ways for a cell to die than I was aware of (see : here)-, it makes sense that the intrinsic pathway is involved, as STAT3 has been linked to it before. In brief (and not completely accurate), this mechanism causes cells to die in response to triggers inside the cell, such as DNA damage, becoming detached from neighboring cells or hypoxia. This would means that high levels of STAT3 function as a brake on the cellular systems to clean up abnormal cells. In cancers, DNA damage is prevalant, as it helps the cancer cells to obtain more mutations, and become resistant to treatment. Also hypoxia is common, as the rapidly growing cells do not have sufficient access to blood vessels to get their oxygen supply. By releasing this brake, the suicide signals get the upper hand and the tumor cells die in massive numbers. As a result, we see a spectaluar tumor shrinkage. In conclusion, we can say that ROS1 gene fusions causes a continuous signal to keep growing, while also suppressing the built-in system of cells to die if abnormalities arise. By releasing the brake on the latter system (mainly through the STAT3 pathway), we see a rapid decline in tumor size as highly abnormal cells are cleaned up. So does a TKI kill cells? No, but it allows cells to die, as they're supposed to do... Can you quit the TKI once your NED? Definitely now! Although the cell mass is gone, or has become too small to detect using PECT/CT, there is absolutely no guarantee that ALL tumor cells have died ! Incomplete response: What if a fraction of the tumors remain? It might be that these cells are not 'abnormal enough', for example the core of the primary tumor, which really holds only the ROS1+ gene fusion. A single DNA rearrangment doesn't trigger apoptosis, as it can be seen in all cells of (healthy) people (source). On the other hand, they might have aquired other mechanisms to evade the regulated cell death mechanisms, through additional mutations. One final conclusion would be that there is a lot to learn on the biology of ROS1+ NSCLC, and for this we need research. So please consider donating to the ROS1ders Cancer model project in the USA, or to Stichting Merels Wereld in Europe. No comments yet. Be the first to leave one !